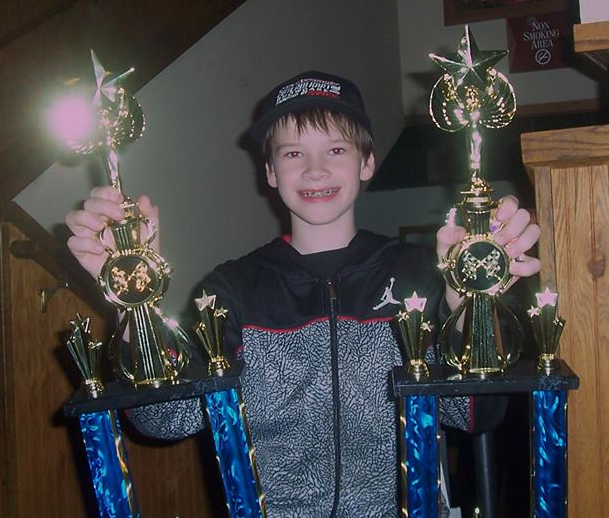 Trevor Grimes proudly displays his Box Stock and 250 Kart championship trophies. Three time winner Malachi Johnson with his Beginners Box Stock championship trophy. Box Stock runnerup Keaton Augustine and father Nathan Augustine. 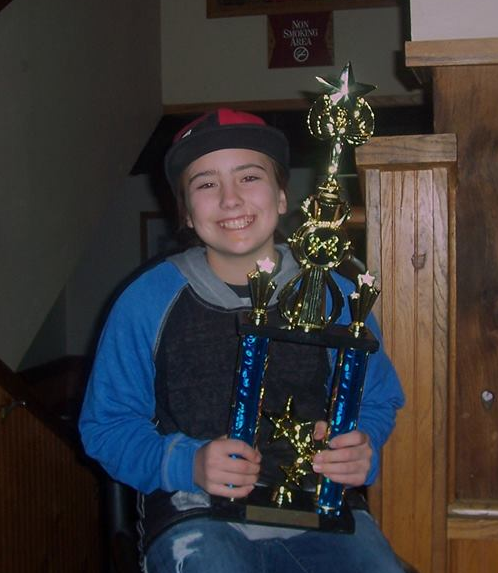 250 Kart championship runnerup Carley Holmes was a three time feature winner last season. White City, Oregon...Several of the stars of Little Southern Oregon Speedway gathered at Abby's Pizza to crown the 2017 Outlaw Kart champions. A bigger turnout than the previous banquet was there to celebrate the 20th season at the smaller track and hear the latest news. Promoter Mike McCann addressed the families regarding the increased 11 race schedule and his plans for a strong 2018 season. Afterwards, 20 trophies were handed out, honoring the Top 5 competitors in each of the regular Cage Kart divisions. The star of the evening was Trevor Grimes. In addition to winning his third straight Box Stock championship on the strength of his four wins and one second place finish, Grimes won two features in the 250 Kart division to secure that championship as well. Word from the Grimes family is we could see Trevor's younger brother making his debut in the Beginners Box Stock division, making it three Grimes siblings competing this season. One of the most enthusiastic and exciting drivers to watch in the 250 Kart class was Carly Holmes, who picked up three victories to secure the runner-up trophy as Cadyn Smith, Braden Weiser and Reece Slyter earned third through fifth place trophies, respectively. Keaton Augustine was there with his Late Model championship winning father, Nathan Augustine, to collect his runnerup Box Stock trophy. Keaton had a win, a second and a third to hold off Yreka champion Taylor Fuller for second in the standings. Fuller was also there to receive his trophy as Sophia Bauer and Vinny DeBenedetti finished fourth and fifth, respectively. The DeBenedetti family will have two Karts this season as Vinnie's sister, Jamie DeBenedetti, makes her debut in the Beginners Box Stock class. 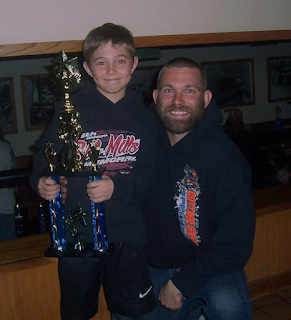 Young Malachi Johnson battled through early season motor problems as he earned the Beginners Box Stock championship. Johnson won the last three Main Events to secure the title. Incoming champion Kiley Grimes had a mathematical shot at the championship going into the finale, and she was at the banquet to receive her runnerup trophy. 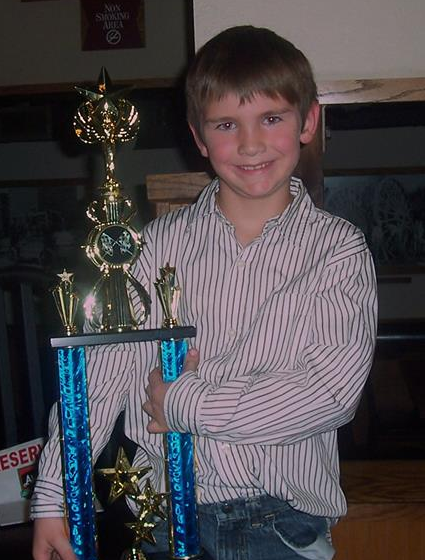 Uriah Sanders, two-time winner Jacob James and Keegan Bounds also earned trophies as they finished third through fifth, respectively. Rising star Tanner Holmes has only been competing in the 500 Open Kart class for a year, but his win and second place finish secured him the championship at his home track. Also noteworthy was Tanner's "Rookie Of The Year" and seventh place ranking at the very competitive Red Bluff Indoor Series this past winter. Mike Wheeler, Wyatt Pinckney, Johnny Burke and Kenny Boardman earned the second through fifth place trophies, respectively. The Speedway Karts will be a part of the 2018 schedule, and their two exciting visits last season were noted. The record shows UAS feature wins were earned by Richard Torzilli and Kenny Boardman last season, while long time track supporter Steve Rambo won both 4 Cycle Main Events. The 2018 season will kick off on May 18th and 19th with a two day event, featuring the Speedway Karts and KT-100 classes. All of the young racers and their families were thanked for their continued support of the Friday night racing program. It was noted that the show couldn't go on without each and every one of them. There will be plenty of excitement and a few surprises still in the works for the coming season. Weather permitting, there is a playday booked for the little track on April 14th. For further information, go to, www.southernoregonspeedway.com.